Richard A. “Aber” Bertiaume, age 86, of Scott Road, Port Washington, WI passed away Sunday, January 13, 2019 at Lawlis Family Hospice in Mequon. He was born on July 14, 1932 in Ashland, WI; son of Joseph and Evelyn Armstrong Berthiaume. A graduate of Ashland High School, he received the athletic and academic award presented to his high school’s outgoing senior representative. He attended Northland College in Ashland, later moving to Milwaukee and finishing his electrical degree from Milwaukee Area Technical College (MATC). 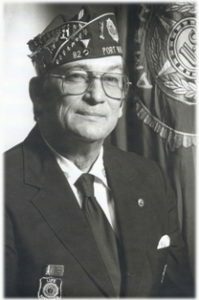 Just prior to that, Aber entered the U.S. Navy, serving as a Sonarman 2nd Class from 1951 until his discharge in 1955. On October 11, 1958, he married Roberta L. Riley, also of Ashland, at the former St. Agnes Catholic Church in Ashland. They will celebrate 60 years together. In 1962, they would move to Port Washington. Richard was a Diagnostic Technician for High Voltage Maintenance Corporation of Milwaukee for many years, retiring in 1997. Over the years he enjoyed hunting and fishing with family and friends. Richard was a life member and past commander with the Van Ells-Schanen American Legion Post 82 of Port Washington. He was instrumental in commissioning the painting of the American Flag on the band shell. He is survived by his wife Roberta, his children Lynn (Kenneth) Audette of Duluth, MN, Rich Berthiaume of New York, NY, Lori Berthiaume of Port Washington, John (Kim) Berthiaume of Boling Brook, IL and Robert (Gretchen) Berthiaume of Racine; grandchildren Brian, Jennifer, Christina and Gabriella; great-grandchildren Barry Richard, Hailey, Maddie, Ivan, Aurora and Bella; his sisters Gloria (Jerry) Giese of Ashland and Phyllis Berthiaume of Milwaukee, Sisters-in-law Patricia Koval, Mary Hill and Elinor Riley other relatives and friends. He is preceded in death by his parents and his sister Virginia Talaska. Family services were held. Interment St. Mary’s Cemetery, Port Washington, WI. Memorials to Dare2Tri (www.dare2tri.org) and Spina Bifida of SE Wisconsin (www.sbwis.org).